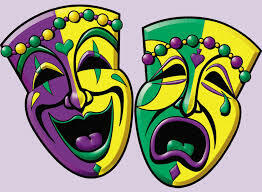 Mardi Gras is a big event in my native home of the Southern Gulf States. It is celebrated heavily between Florida, Alabama, Mississippi, Louisiana, and Texas. I’ve even seen evidence of attempts at celebrating it as far west as Monterey, California, but nobody does it like home. Although New Orleans is thought of as the home city of American Mardi Gras, the first American celebration of the holiday took place in Mobile, Alabama in 1703. Coming from the French tradition, Mardi Gras is similar to the Carnival traditions found throughout Europe and Latin America. It tends to occupy several weeks before and on Fat Tuesday, the day before Ash Wednesday and the beginning of Lent. Lent being a 40 day period of fasting and abstention in the Catholic tradition, Fat Tuesday and the days leading up to it is a time to let it all out, to party, to drink, and for many to sin. As such it is a festival season celebrated with wild abandon, parades, carnivals and debauchery. Costumes and masks are an important part of the festivities, epitomized by the classic theatre masks. A Mardi Gras parade can be a rowdy affair. As the parade floats pass by (each one manned by a krewe, or in Mobile a “Mystic Society”) the attendants compete for cheap plastic beads and trinkets, and aluminum doubloons. King cake is a tradition going back to the old world. The New Orleans variety consists of a twisted cinnamon roll iced with the colors of the holiday: purple, gold, and green. Traditionally, inside the king cake would be hidden a little plastic baby signifying the baby Jesus, but is often just referred to as the Mardi Gras baby. Whichever person gets the piece with the baby inside is promised a prosperous year. As much as Mardi Gras is about the festival and indulgence, it should not be forgotten that this is leading up to a 40 day period of fasting. This is a significant time of year. To the ancestors this season heralded in a time of scarcity as the winter stocks began to dwindle before the season’s crops could provide any sustenance. Though the celebrations may seem excessive, it is intended to be followed by a month on penance and discipline.